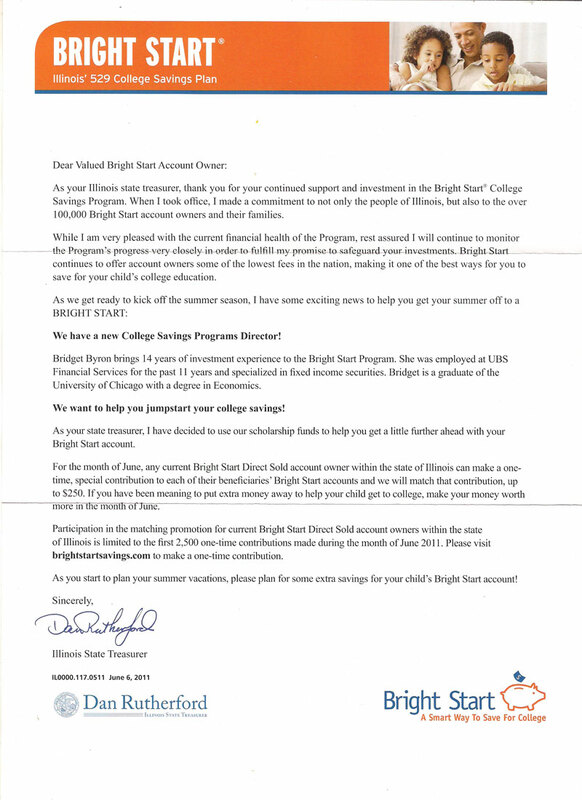 When I got home from work on Friday, June 3, 2011, I found a letter from Bright Start, Illinois’ 529 College Savings Plan, that announced a really promising contribution-matching promotion. The text of the letter, along with a scan, is below. As your Illinois state treasurer, thank you for your continued support and investment in the Bright Start College Savings Program. When I took office, I made a commitment to not only the people of Illinois, but also to the over 100,000 Bright Start account owners and their families. While I am very pleased with the current financial health of the Program, rest assured I will continue to monitor the Program’s progress very closely in order to fulfill my promise to safeguard you investments. Bright Start continues to offer account owners some of the lowest fees in the nation, making it one of the best ways for you to save for your child’s college education. We have a new College Savings Programs Director! Bridget Byron brings 14 years of investment experience to the Bright Start Program. She was employed at UBS Financial Services for the past 11 years and specialized in fixed income securities. Bridget is a graduate of the University of Chicago with a degree in Economics. We want to help you jumpstart your college savings! As your state treasurer, I have decided to use our scholarship funds to help you get a little further ahead with your Bright Start account. For the month of June, any current Bright Start Direct Sold account owner within the state of Illinois can make a onetime, special contribution to each of their beneficiaries’ Bright Start accounts and we will match that contribution, up to $250. If you have been meaning to put extra money away to help your child get to college, make your money worth more in the month of June. Participation in the matching promotion for current Bright Start Direct Sold account owners within the state of Illinois is limited to the first 2,500 one-time contributions made during the month of June 2011. Please visit brightstartsavings.com to make a one-time contribution. As you start to plan your summer vacations, please plan for some extra savings for your child’s Bright Start account! Realizing that with 100,000 accounts, the 2,500 available matches were going to be used up quickly, I immediately went to the Bright Start web site, found the little blurb mentioning the promotion on the home page, logged in and contributed $250 to each of my two 529 beneficiary accounts. This was probably around 6:15 pm on Friday, June 3. The Bright Start web site stated that the number of contributions matched so far would be reported on the Office of the Illinois State Treasurer web site. 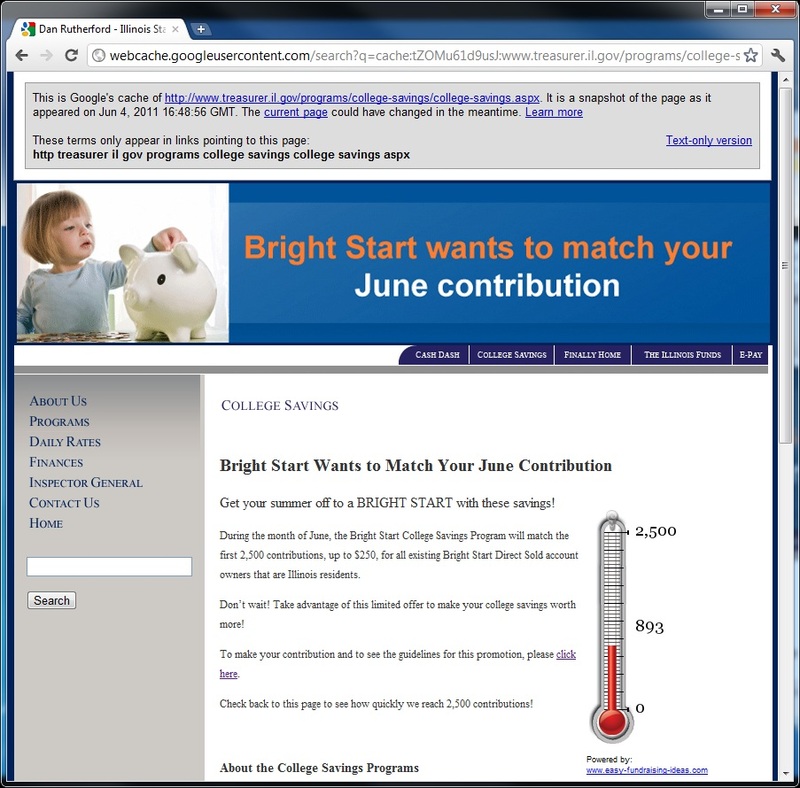 When I checked the page at http://treasurer.il.gov/programs/college-savings/college-savings.aspx around 6:30 pm on Friday, June 3, it displayed an image of a stylized thermometer showing that 893 contributions had already been matched. The meter came from a third-party site, and there was a hyperlink at the bottom of the meter to that site. I now deeply regret not taking a screenshot of this meter at the time. I would very much like to know why this company’s data was so wrong and to contact as many of their clients as possible with this story. Thank you, Google! Below is a screenshot of Google’s cached page as it appeared on Jun 4, 2011 16:48:56 GMT. Dear www.easy-fundraising-ideas.com, you and someone at the Treasurer’s office have some explaining to do. Based on the information at the Office of the Illinois State Treasurer web site, I was confident that more than half of the remaining matches were available as of June 3, 2011 and that my contributions would be matched. When I checked the meter again on Sunday, June 5, it had not changed. This sort of made sense, as I didn’t expect that any more contributions would be processed until the following business day, so it was reasonable to believe that the meter was accurately reporting only processed contributions from the previous Friday. But, it now appears that the meter was not dynamic and was not updated as of the close of financial markets at 3:00 pm C.S.T. on Friday, June 3, 2011. The reported number of contributions as of 6:00 pm Friday was, and probably always was, inaccurate. On May 31st, 2011, the Illinois State Treasurer’s Office mailed hard copy letters to all of our Illinois Bright Start Direct Sold account owners via first class mail announcing a June Matching Contribution promotion. Due to an overwhelmingly positive response, the maximum number of contributions as set out in the promotion’s rules, 2500, was hit by close of financial markets at 3:00 pm C.S.T. on Friday, June 3, 2011. We are thrilled that so many account owners chose to participate in this first-ever matching promotion. While we wish that we had the funds to accommodate all contributions, we must abide by our promotion’s restrictions. Those contributions that were received, either electronically or via hard check, before the cap was reached will be matched. Please check your upcoming account statements or call 1.877.43.BRIGHT (1.877.432.7444) to verify if your contribution was matched. We appreciate your continued support of the Bright Start program and hope that you will take advantage of any future incentive programs. So basically, by the time I opened and read my letter (and for those people who received their letters on Saturday, before it was even delivered), this promotion had already been fulfilled. Bridget, I fervently assure you that I will be very wary of taking advantage of any future incentive programs if they appear as poorly thought-out as this one happened to be. According to the hard copy letter, there are “over 100,000 Bright Start account owners”. I’ll look for more accurate numbers, but assuming for the sake of argument that all 100,000 owners were citizens of Illinois, that each account owner had only a single beneficiary account, and that each account owner made a contribution of $250 in order to receive the maximum match, that means that only 2.5% of the beneficiary accounts would benefit from the match. Furthermore, I would venture to guess that a good number of account owners have more than one beneficiary account and contributed $250 to each (as I did), so that the matching funds probably went to far fewer than 2,500 families. If the average account owner has 2.5 kids, then only 1 percent of account owners would have seen any of this money. Now, these estimates are purely hypothetical, but at best, only 2.5% of the families who are saving for college benefited from this. Would it not have been better to lower the amount of the match and thereby increase the number of accounts that could receive some of the $625,000 in available funds. Halving the match to $125 would benefit 5% of the beneficiary accounts, and reducing it to $25 would have spread it among 25% of the accounts. Now, it probably wouldn’t have maxed out so quickly, but Bright Start still would have gotten their $625,000 in new contributions, and they wouldn’t have so many pissed-off people, either. Thank you for your interest in the Bright Start Savings Direct Save and Match program. Due to the positive response to this offering, we have met the maximum match offers. Thank you for your continued interest and check back regularly for future promotions. Hooray! What a huge success! I feel particularly bad for Bridget Byron, who joined Bright Start as the College Savings Program Director only last month, and who had to put her name on the bottom of the email that must have been among the least favorably received emails in all of Illinois today. Amusingly, Bright Start has a twitter account: http://twitter.com/#!/Bright_Start but hasn’t used it yet. Also, according to the Illinois State Treasurer’s Office company page at LinkedIn, “Treasurer Alexi Giannoulias serves as the state’s banker”. So maybe it’s no wonder that the office can’t make web sites work. However, I am delighted to find that there are frustrated people on Twitter and elsewhere complaining about this. There are a few things that I find particularly disappointing about this whole debacle. First is that there is an expectation that easily measurable data, such as the number of entries submitted so far in a promotion, should be accurate and updated in real-time. There is absolutely no reason that the time-sensitive information on the IL Treasurer’s web site should be so incredibly inaccurate for days at a time. Second is that the Illinois State Treasurer’s Office/Bright Start makes no apologies for running a promotion that did not distribute the available funds to a sufficient number of account owners. You contacted a huge number of people who even if they had acted as fast as reasonably possible to participate still had no realistic way of getting their contributions in on time. Third is that the Illinois State Treasurer’s Office/Bright Start did not offer to refund the contribution amount to account owners who had contributed between close of business on Friday and when the web sites were updated and/or the email announcing the end of the promotion was distributed on Tuesday. I feel that this would be just and fair. I participated in this promotion because I saw a high likelihood of getting a 100% return on my investment. Now, as that return is no longer possible, I want to invest that money somewhere else. Sour grapes? Maybe. But Bridget Byron/Bright Start’s attitude in the Tuesday email of “thanks for the money, suckers” is hard to swallow. I rather expect that Bright Start will consult with some lawyers and decide on a course of action that will compensate the people who made contributions between Friday and Tuesday. I hope that this will get some attention in the Tribune, as it’s not the first time that Bright Start has seriously disappointed its participants. Update: It seems that the promotion was first announced on the Bright Start website on May 27, 2011, at https://www.brightstartsavings.com/OFI529/PN/generated/en_us/PrimaryNavigation_05-27-11-101806.xml in a post titled “Bright Start wants to jump start your summer savings by matching your special contribution!”. This would explain how certain account owners were able to take advantage of the promotion before the letter was distributed. So if they were willing to announce it on the web site, why couldn’t they also send an email on June 1st and then follow up with a letter? The first 2,500 Illinois residents with existing Bright Start Direct-Sold Accounts to make a manual contribution into a Bright Start College Savings Program 529 Direct-Sold Account between 12:00am (CT) June 1, 2011 and 11:59pm (CT) June 30, 2011, will receive a matched deposit, up to $250, from the Bright Start College Savings Program. Manual contributions include both electronic and hard copy check contributions. Please check brightstartsavings.com and treasurer.il.gov to see when the 2,500 limit has been reached. Automatic Investment Purchases and Payroll Deduction Contributions into the Bright Start College Savings accounts are excluded. Limit one (1) deposit match per account. If an account owner has more than one (1) Bright Start account, each account is eligible for one (1) match up to $250 each. Deposit match amount will be deposited to the Bright Start account no later than 90 days after the qualifying deposit. This promotion is only available to existing Account Owners that are Illinois residents with Bright Start Direct-Sold Accounts and is limited to the first 2,500 participating accounts. Accounts opened after 11:59pm (CT) May 31, 2011 or under the Bright Start Advisor-Sold Plan are not eligible. Employees of the Illinois State Treasurer’s Office are not eligible to receive matching funds. Void where prohibited. This material is provided for general and educational purposes only, and is not intended to provide legal, tax or investment advice, or for use to avoid penalties that may be imposed under U.S. federal tax laws. Contact your attorney or other advisor regarding your specific legal, investment or tax situation. Sponsor: Bright Start College Savings, Program PO Box 6498, Chicago, IL 60680-6498. Seriously, what about the poor saps who sent in checks? They probably haven’t even arrived yet. The more I think about this, the more it seems like someone came up with this promotion in order to distribute funds to well-connected people who were privately informed of the promotion in advance of the hard copy letter. Bright Start had gained at least an additional $625,000 in the first three days of June, not to mention all of the contributions made by people on Friday evening and over the weekend while both the Bright Start and the Treasurer’s sites still implied that their contributions would be matched. If I were trying to scam people, I’d certainly time the mailing of the letters so that they were delivered on Friday and Saturday, and – oops – forget to update the web site all weekend. It’s pretty outrageous. And I still want my contributions matched. This entry was posted in Nonsense, Thriftiness on 7 June 2011 by Oliver Baty. I did the same thing, and relied on the information posted to the State Treasurer’s office website before making my decision to do a one-time contribution (x4 beneficiary accounts) on Saturday morning. I was furious with today’s email, and have already sent a complaint via the ‘Contact Us’ section of the Bright Start website. I am also upset I didn’t do a screen print of the State Treasurer’s website, but I believe a legal discovery (if it comes to that) would unearth the facts. Here’s hoping they honor the match to those of us who detrimentally relied on the website. I parted with my $250 at 3:57pm on Friday and there was no indication on either website that the maximum had been reached. It’s interesting that these geniuses communicate information, that is critically time sensitive, via snail mail. The critically time sensitive “limit has been reached” meter was not updated real- time. But, the non time sensitive communication from Ms. Byron, basically telling you that you were screwed and they’re not going to do anything about it, was sent real-time via email. Illinois is the poster child for corruption and mismanagement. You would think that after living here for so long that I would know better. For those that ask “if the state is broke, where did they get the money for the matching funds?” They’re going to use the money we just sent them as the matching fund money. Our “investment” with “BS” exists on paper only. They only have to worry about actual dollars backing up those investments if 1) An honest audit of the funds were to be made or 2) everyone pulled all their money out at once. Neither of those things is going to happen. They’ll worry about replacing the funds later, by that time it will be some other persons problem. Sorry for the rant, but there is a limit to how much cr*p a person can take, and I’ve reached my limit with this state. If I could sell my home I would leave in a heart beat. Every day brings with it a new scam in this state. I’m not vindicating Bernard Madoff, but he was correct when he stated (paraphrased) “It’s all just one big lie” and “It’s all just one big Ponzi scheme”. Why is this an issue? It’s a frickin college fund for your kid. God forbid you should set money aside for their future. I’m glad this got peoples attention and motivated them to contribute more for their child’s future. I’m with Tom. Everyone should have known going in that they might not get the match – only the first 2500 were going to get it. And even if someone didn’t get the match, it’s not like they lost any money. The $250 is still in the account for the kid’s education. Why the big deal? Seems like a lot of people are completely overreacting about this, if you ask me. Yes, I can think of much worse things I could have done with my money, but I would not have contributed to the plans at this time had I known that the contributions would not be matched. The widely felt bitterness, I believe, comes from being lead to believe that the contributions were made in time to qualify for the match and the way in which we were informed that our contributions did not qualify. I’m in the same boat. I got the mailing when I reached home on Friday evening. I then checked the counter (at 893), and made my contribution at 6:30 p.m.
Just poorly designed and executed. They would have been better off with a smaller match amount, so that the promotion would not run out before everyone received the notice. I did not receive the letter until the 7th but since it was dated at the bottom June 6th I thought there would be no problem. I sent in the money only to find out that the offer had expired prior to my receipt of the offer. This violates basic principles of just and fair distribution of social resources. Those who say “who cares?” miss the neo-Rawlsian point about fair distribution in a democracy. In order for the requirements of just distribution to have been met all to whom this offer applies ought to have been given equal opportunity to access the resources. Being informed of the offer post-facto violates this fairness obligation. Thanks for the rant. I was pissed off about this as well. I’m pissed that the state is broke, sends a first class letter to 100,000 people, and matches with money they don’t have. They then send an email to all of us saying we’re too late. If they have our emails, why not email us the initial offer to get it to us faster and for cheaper. This pissed me off so much I stopped my contributions. I’ll save for my kids, but not in the Illiniois plan. We’re governed by idiots. It appears the AP just put out a follow up article today, stating refunds of the $250 investments would be made, with no penalties or taxes. I hate to rely on that information, lest I receive a distribution tax form at year end, in yet another screw-up. A follow up article gives more details, etc! The program directer says state employees were encouraged to participate and to invite their friends and family to participate. He also says none of them did. I would lay long odds that an independent investigation would reveal that pretty much all of these funds were granted to people with inside informations for contributions that were made about the time the letters were sent out. Of course, the internal investigation revealed nothing of this nature, of course. If this happened on Wall Street with a 100% return, people would be prosecuted for insider trading.